Went to &Sons Bacaro for a 6pax family dinner on 4.10.2014. It was an excellent choice! 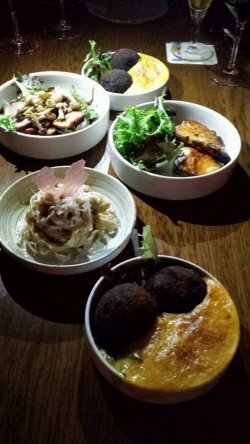 The food was good, dishes were served in small plates, kind of like italian tapas. The restaurant was by beppe devito. somehow i didn’t really fancy il lido much even with 50% for 2pax palate discounts (never tried it under palate actually) & it was “far away” in sentosa. maybe ought to consider trying some time. The place was chic as advertised on its website, which also showed menu items & prices. not really buzzy on a saturday evening (same for other chic restaurants on nankin street), a pity but no complaints from us…haha! sons was less than 50% full, and interestingly the other 5 tables looked mostly family like us. we had the wagyu tagliata. it was good, chargrilled flavourful, tender, medium rare. Baccala (salt cod) cake with uni sauce was the best dish of the night. thin crispy crust was excellent, minced salt cod was excellent, and great uni sauce combination. I would put the light cream, flavourful truffle pesto tagliatelle (top photo) as my second favourite for the night. no feel of pesto though – not sure how a strong pesto flavour goes with subtle truffle scent. The roasted cod was very good. my wife & i both made very good cod ourselves at home. this though had better grilled flavours. the grilled kurobuta pork neck was very good, like a good char siew or thecharcoal broiled pork collar at imperial treasure teochew. maybe i should try & reinvent this dish at home again. I liked the iberico pork truffle paccheri too. very agreeable but i prefer the truffle pesto if asked to choose. Burrata was fine, nothing like the supreme version in valentino, after all that cost 3x more. Surprising the same uni sauce did not come out good on this carbonara dish. i would not order this. Looked like ah bor ling – mochi dumplings..cheese was very strong, not sure if blue cheese. anyway i like blue cheese, but it is not the most popular dish. We had a S$55 bottle of wine, 2 beers & 1 mojito. dinner for 6pax came to S$260nett, about S$30nett pax excluding drinks, pretty ok. The service by the western servers were ok, not too friendly, kind of unsmiling. one server kept filling water to the glasses, a good thing. Their lunch is cheaper with S$10 pasta etc. The street is quite interesting with mad poets gastrobar, platypus gourmet etc. I will go back again.